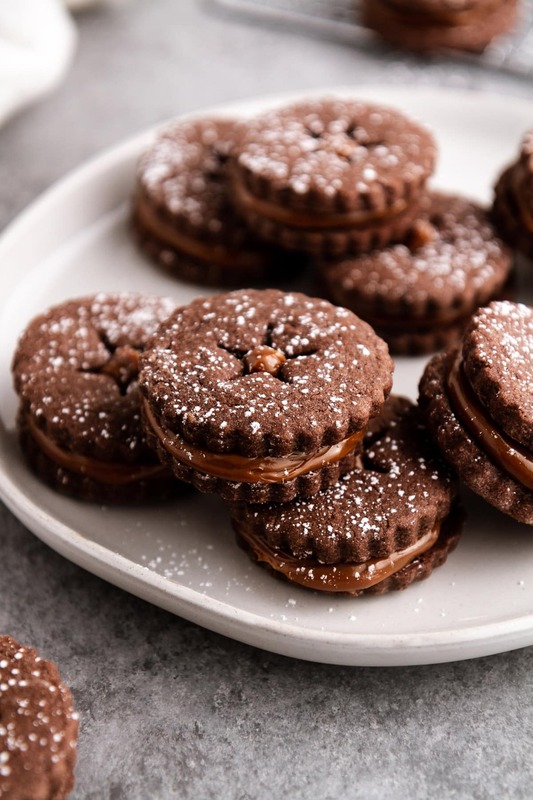 These chocolate alfajores — South American caramel cookies with dulce de leche-filled centers inside a cookie sandwich — are officially the mascot cookie of our household. 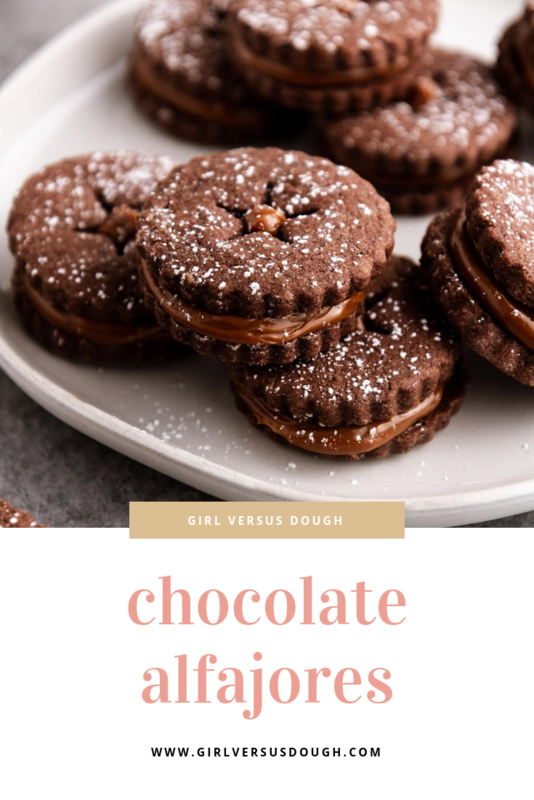 The cookies have the taste and texture of a brownie and the caramel center is thick and creamy. So yeah, it’s safe to say this cookie recipe is not going anywhere anytime soon… except straight into our bellies. When you know you’ve stumbled upon a good cookie idea, you just know, you know? You know. I know you know. 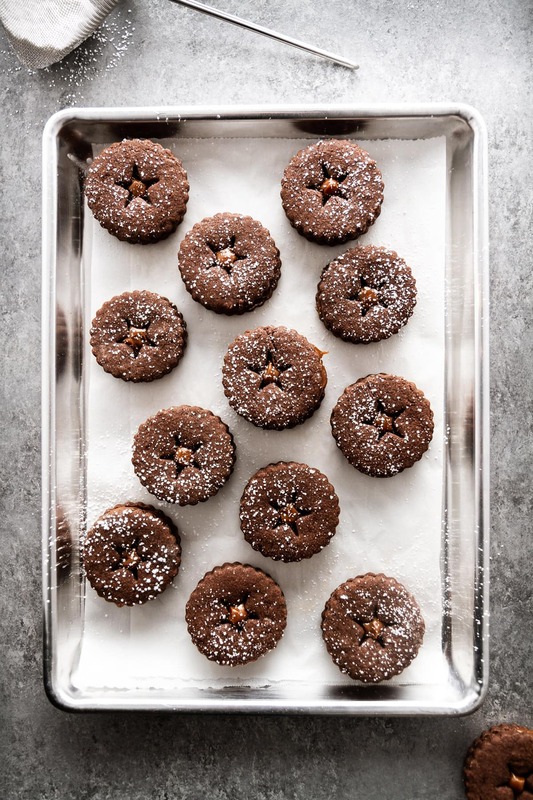 That’s what happened to me, anyway, when the idea for chocolate alfajores — aka, brownie-like dulce de leche sandwich cookies — came to mind. And I just KNEW. You know? 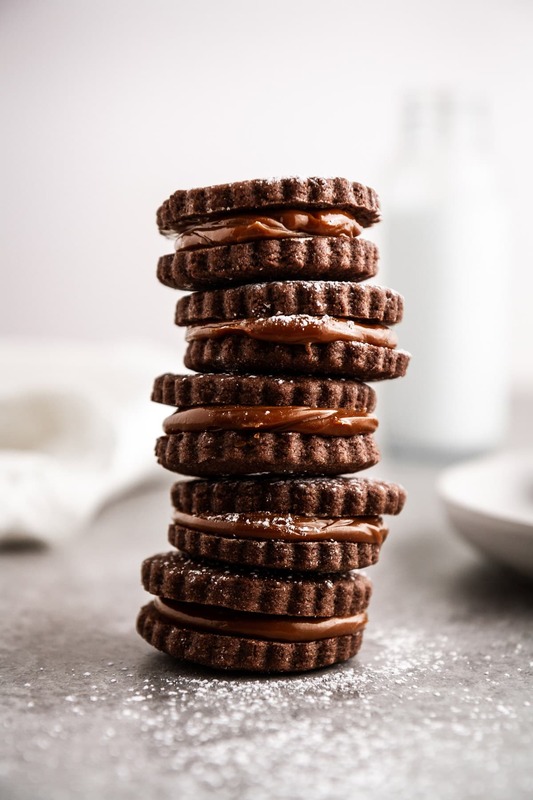 Here’s a little history lesson for ya: Alfajores are sandwich cookies filled with dulce de leche (a creamy caramel made from milk and sugar) that originated in the Middle East. They made their way to Spain, and from Spain to South America, and have become an institution there ever since. And now, as I mentioned before, they’re an institution in our household as well, but in chocolate form. My husband declared them the best cookie I’ve ever made, and my daughter told me I’m the best cookie maker in the whole world. Despite what is an overstatement from my four-year-old, I am flattered, and will be making these cookies henceforth any time a cookie is needed (bake sales, parties, dinners with friends, potlucks, just because, etc.). Thankfully, they couldn’t be simpler to make. You bake an easy chocolate roll-out cookie, then sandwich them with dulce de leche, which actually comes in a can from the store (!). Excuse me as I now go purchase every single can of dulce de leche from Target. Sprinkle them with powdered sugar, if you like, and you’re done. Oh alfajores, I just love you. 1. I used this linzer cookie cutter to cut out the cookie rounds because I love the little peek of caramel that pokes through the centers, but feel free to use any approximately 2-inch cookie cutter you have on hand. 2. 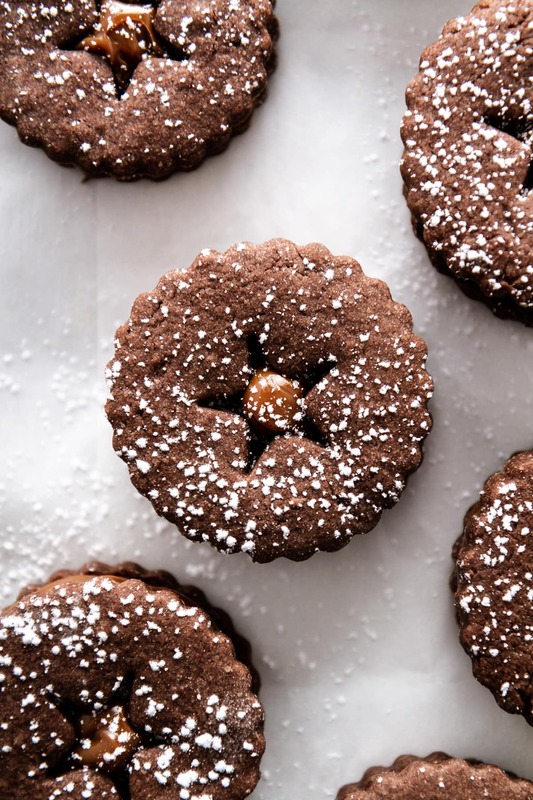 If you want to get real fancy with these cookies, you can use high-quality cocoa powder for the cookies. But to be honest, I went with ye olde standby of Hershey’s cocoa powder and I think the cookies turned out pretty dang fine. 3. Dulce de leche from the store is pretty thick right out of the can, but if you’re finding it a little runny or difficult to work with (sometimes the heat from your hands can soften it too much while piping), let it chill in the fridge while you bake and cool the cookies before piping it on. Keep popping the piping bag in the fridge or freezer for a few minutes any time the caramel gets too soft from the heat of your hands. Alternatively, spoon the dulce de leche onto the cookies (though it might not look as pretty). 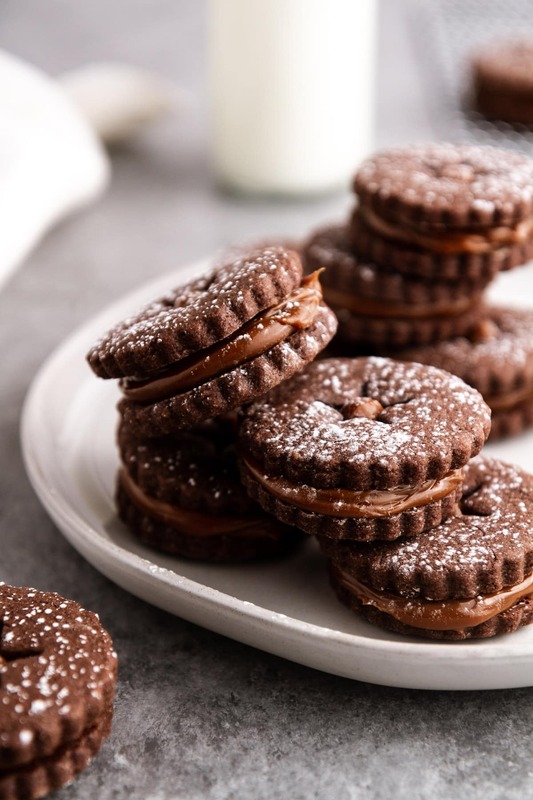 I hope you love this chocolatey twist on alfajores as much as we do. If you don’t, you can send all the dulce de leche to my place. I’ll make room in my pantry. PS Want more cookies for your face? I have all the cookie recipes. Heat oven to 350F. Line a large cookie sheet with parchment paper. In a large bowl, whisk flour, cocoa powder, salt and baking powder until well combined. In a separate large bowl with an electric hand mixer or in the bowl of a stand mixer with the paddle attachment, beat butter and sugar on medium-high speed until light and fluffy, about 2-3 minutes. Stir in eggs on low speed one at a time, then stir in vanilla until just combined. Gradually stir in flour mixture on low speed until just combined. Cover and refrigerate dough at least 1 hour. On a well-floured surface, roll out chilled dough to 1/4-inch thick. Use a cookie cutter (I used a 2-inch linzer cookie cutter) to cut out cookie rounds; transfer to prepared cookie sheet, spaced 1 inch apart (you’ll have to bake in batches). Re-roll dough once, if needed, to cut more rounds. Bake 8-10 minutes until set and puffed. Cool 1 minute on baking sheet, then transfer to a cooling rack to cool completely. Pipe or spoon approximately 1 tablespoon dulce de leche on the bottoms of half of the cookies. Top with remaining half of cookies. Store covered in an airtight container up to 5 days. These look very good. I have never heard of this kind of cookie. Not even sure of the pronunciation. HA!! My husband would love these I am sure. Charlotte, no need to know how to pronounce them when the most important part is the eating. 😉 Thank you! SOOO pretty and omg so delicious-that filling is so dreamy! Kayle, thank you so much! The filling is my spirit animal.